The Spitzkoppe (also referred to as Spitzkop, Groot Spitzkop, or the "Matterhorn of Namibia"), is a group of bald granite peaks or bornhardts located between Usakos and Swakopmund in the Namib desert. The granite is more than 700 million years old and the highest outcrop rises about 1784 meters (5857 feet) above sea level. Must involve visitors undertaking some educational task that relates to the Earth science at the site. This could involve measuring or estimating the size of some feature or aspect of the site, collecting and recording data (such as time of a tidal bore), or sending an e-mail to the cache owner with the answer to Earth science related questions they obtained by reading an information display. While photographs may be requested, they do not take the place of other logging requirements. Taking a photograph alone or asking people to do internet research does NOT meet these logging guidelines. Requests for specific content in the photograph (must include the visitor's face, for example) will be considered an additional logging requirement and must be optional. Cache owners may not delete the cache seeker's log based solely on optional tasks. To Log your earthcache find, please do the following (answers by email please, not in your log):Email the answers to me within 14 days, if not your log will be deleted. 3 Site questions; 1 Document question; 1 Photo optional. 1. ( Site question) Standing at the coods the hole or rock bridge is in front of you. How wide and high would you say is the big hole under the rock bridge? 2. ( Site question) The granite massif, which is part of the Erongo Mountains, was created by the collapse of a gigantic volcano more than 100 million years ago and the subsequent erosion, which exposed the volcanic rock, granite. Look at the exposed granite. Describe from the “crystal” or grain size whether this rock cooled quickly (like a diorite or obsidian with small grains) or more slowly to produce larger grains. 3. ( Site question) Describe what the granite looks like (including texture and colours). 4. ( 1 Document question) Bornhardts (pronounced /'b?rn'h?rt/) are dome-shaped, steep-sided, bald rock outcroppings at least 30 metres (100 ft) in height and several hundred meters in width. A type of inselberg, they are typically composed of granites or gneisses. What other names are Bornhardts known as? Can you see any of this sapes at the Spitzkoppe site? 5. (optional) Photo of you with your GPS at coordinates in front of arch Bridge. The granite is more than 700 million years old and the highest outcrop rises about 1784 meters (5857 feet) above sea level. above the floor of the desert below. A minor peak- the Little Spitzkoppe - lies nearby at an elevation of 1584 metres above sea level. Other prominences stretch out into a range known as the Pontok Mountains. Many examples of Bushmen artwork can be seen painted on the rock in the Spitzkoppe area (see below "Bushman Paradise"). History of Ascent. Any ascent of the peak involves exposed and delicate rock climbing of a high grade. While the standard route up the peak is not severely difficult in modern technical terms, it presented quite a formidable undertaking in the earliest days, owing to the isolation of the peak, the heat of the desert and the total lack of water. Before the First World War what is now Namibia was German South West Africa. It is possible that the main peak was summited as early as 1904, when a soldier of the Imperial Schutztruppe supposedly soloed the peak and made a fire on the summit. What he may have burned remains a mystery, as there is absolutely no natural fuel of any kind on the upper parts of the peak. The legend suggests that he never returned and that his body was never recovered. Certainly, no proof of his conquest is available today. The first documented conquest was made by a team of climbers from Cape Town, led by S. le Roux. The next party - O'Neil, Shipley and Schaff - pioneered a route up the northern extremes of the peak, after having failed on the southwest ridge. They gained access to the gully now known as the "scramble" but ran out of time to attempt the final faces. Four days later they made another attempt but finally gave up. Some of the earliest climbers, defeated by an extraordinarily smooth band of granite only about 3m high, resorted to carving steps into the rock with a hammer and chisel. A few months later Hans and Else Wong and Jannie de Villiers Graaf arrived and they reached the summit at noon, in November 1946. For the next quarter of a century the mountain maintained its reputation of presenting a two- or three-day struggle to potential climbers. (There are accounts of these ascents in old volumes of the Journal of The Mountain Club of South Africa - one of which can be found at scanned extracts from MCSA Journal). This era came to an end in 1971, when the peak was climbed in four hours by a party led by J. W. Marchant from the University of Cape Town Mountain and Ski Club. Included were the talented South African climber Gabriel Athiros and Oliver Stansfield from England [2 June 1971]. This team scaled all of the lower pitches without ropes and got through the difficult band without using the artificial steps hacked into the granite. They descended from the peak in two hours and as they reached the base rain began to fall for the first time in over a year. The modern era commenced. E. Haber, together with A. Lombard, C. Ward and Holding completed the first direct ascent of the South West Wall. They began their endeavours in 1977 but did not succeed in finishing the route before 1982. M. Cartwright and M. Hislop freed the route in 1988, giving it a grade of 22, which was later revised to 24. C. Edelstein and G. Mallory left their mark in 1983 by completing "Royale Flush", another monster route that was freed only in 2000 by J. Wamsteker and S. Wallis. During 1991 M. Cartwright, K. Smith and M. Seegers put up a difficult route named INXS graded 24 left of the South West Wall route. In 1896, a trading post was built by the German Colonial Society. Later it was transferred to the Farmer Jooste and a police station was built (the foundation walls are still under Pontok 4 chroma noise). In 1964, under the so-called Odendaal-plan of the Odendaal Commission for the creation of home territories (Home lands) for the black population, the farm was expropriated with compensation. In 1970 they moved multiple Damara families here, which were in fact a village with a church and school development. Since 1998, the municipal campsite and the area was declared as #Gaingu-conservancy on 07.09.2003 around the Great Spitzkoppe. Unfortunately, a Hollywood film company erected a high game fence which cuts off the entire area between the large Spitzkoppe and Spitzkoppe Pontoks. This represents about half of the camping places which ceased to exist, access to many climbing rocks and also the normal route to the Great Spitzkoppe barred. 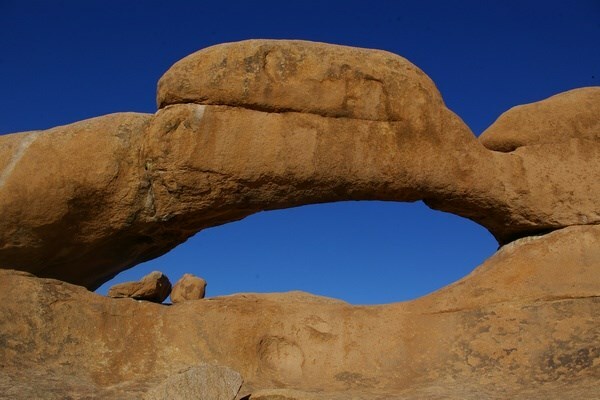 The popular Circumnavigation of the Great Spitzkoppe (1 - 1.5 hours) is no longer possible. "Bushman Paradise" made accessible through a gate with chains, has lost its attractiveness, as almost all of the 2000 - 4000 year old prehistoric rock paintings have been destroyed. Around the foot of the Great Spitzkoppe you can still find good drawings, especially at the "Rhino Rock". Bornhardts (pronounced /'b?rn'h?rt/) are dome-shaped, steep-sided, bald rock outcroppings at least 30 metres (100 ft) in height and several hundred meters in width. A type of inselberg, they are typically composed of granites or gneisses, though occasionally found as dacites, norites, limestones, sandstones and conglomerates like Uluru. They are named after Wilhelm Bornhardt (1864-1946), a German geologist and explorer of German East Africa, who first described the feature. The Sugar Loaf Mountain of Rio de Janeiro is a typical example of this landform and is the origin of the common bornhardt nickname "sugar loaf". Bornhardts are seen at their best in arid and semi-arid regions, but occur over a wide range of climates. Found in diverse topographic settings they mainly occur in multicyclic landscapes. They give rise to other types of inselberg, such as nubbins (or knolls) and castle koppies. Depending on their shape they are known as sugar loaves, whalebacks, turtlebacks or simply domes. They are locally known as dwalas, half-oranges, matopos, morros, etc. Often, the underlying geological fracture pattern is shown by the surface arrangement of bornhardts, as can be seen in the Kamiesberge of Namaqualand and the Everard Ranges of Central Australia. I have used sources available to me by visiting the site, the Polokwane library, internet, research, and asking questions to get information for this earth cache. The bridgeWow what a hole.